Since the gauze either comes in pre-cut pieces or on a roll, the only real difference between different size kits is the size of the transparent film dressing and the quantity of gauze. Application of the gauze dressing usually involves laying into the wound bed the oil immersion dressing, followed by the perforated drain wrapped in gauze, followed by enough gauze to fill the wound bed. The gauze should be saturated, typically with normal saline. Sometimes there is more than one wound. 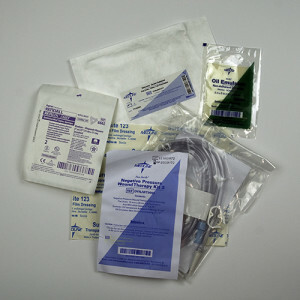 In order to utilize one wound vac for multiple wounds, “Y”s can be used to connect the multiple dressings to one wound vac. If the wounds are close together, another method is to bridge between the two wounds. In this method, the skin between the two wounds is protected by a transparent film, then a piece of foam is used to provide a suction connection between the two wound dressings, which is then covered by transparent film. There are times when the typical transparent film dressing will not provide a seal. We have found that 3M Tegaderm will usually correct this problem. If this doesn’t work, give us a call as we have found some other tricks that can work in these very difficult situations. The Negative Pressure Therapy Store can provide you with several different options if you need gauze dressing kits. If you are interested in this product, please fill out the following form and we will respond within 24 hours, or call 800-511-2601 extension 600. Click here if you wish to purchase gauze dressings online.